Have you ever wondered what all the fuss is about with those yoga ball chairs? You have to wonder how easy they are to sit on and what they really do for your back. Apparently, there are more and more studies that show how bad stationary chairs can be for your back, so many people are considering alternatives to help them with an activity that takes up a good part of their day. One interesting benefit of balance ball office chairs is that they help you burn more calories compared to regular office chairs. When shopping for a balance ball chair, it is important to look at the different features closely as not every balance ball office chair is a good match for everyone. Here are a few tips on what to look for in the best balance ball office chair and a few reviews to help you start shopping. 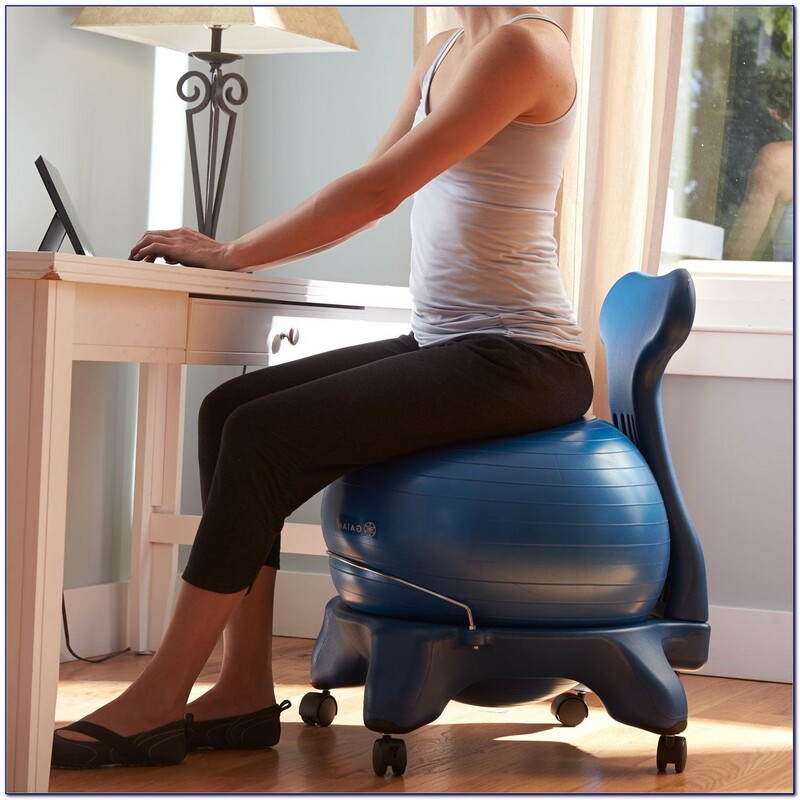 Click Here for the Best Balance Ball Chairs Available in 2017! The most important consideration you should have when shopping for your balance ball office chair is the diameter of the ball. It is important that the overall diameter can hold your weight as well as fit your height. One of the best benefits of a balance ball is that you are forced to sit straight while balancing on the ball which helps to improve your posture. If you do find yourself needing to relax on occasion and would like the back support, there are many chairs that come with that additional feature. The perfect balance chair should have large wheels that lock. Small wheels may not give the right amount of support for the person that is sitting in the chair. Large wheels will give you stable and firm support that you will never have to question. Wheels that lock, especially the rear wheels, are also a great feature. 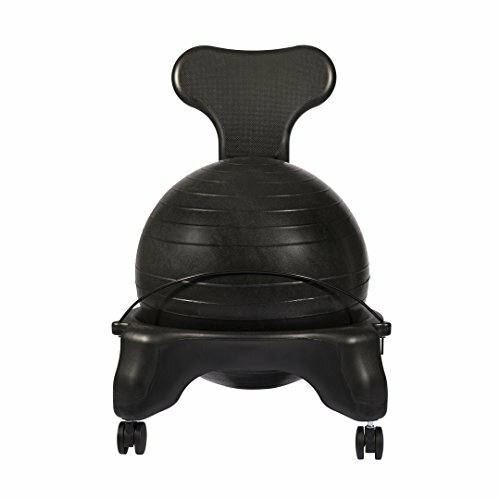 An ideal balance ball office chair should have large wheels and, more importantly, locking support. This will make sure you don’t accidentally roll while you are engrossed in your work. Any chair needs to have height adjustability to make sure you can reach your workspace comfortably. Since balance ball chair manufacturers are sometimes more preoccupied with the diameter of the ball, they may miss the height adjustment feature. Developed by pioneer chiropractic Dr. Randy Weinzoff, the Gaiam Classic Balance Ball Chair helps to relieve your aching back, legs, and arms that develop after hours of sitting in an uncomfortable stationary chair. The Gaiam Balance Ball will give you better spine alignment as well as posture promoting better overall well-being. The Gaiam Balance Ball Chair is designed for those that between 5 feet and 5 feet 11 inches tall, and it also comes with caster wheels that have the easy-glide feature, an adjustable support bar, an air pump, and a secure metal ball holder. The Gaiam Balance Ball Chair is a useful tool that helps you to strengthen your core muscles while improving your spinal alignment. 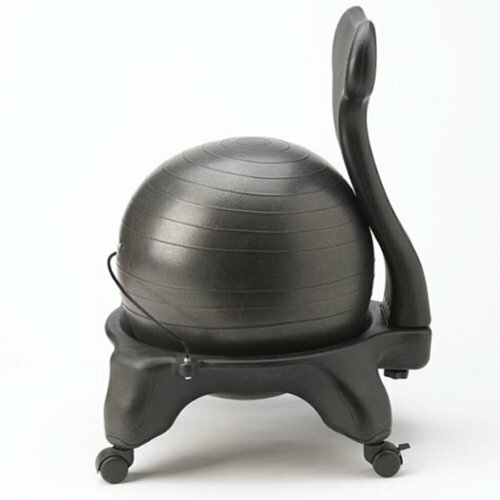 Here are a few pros and cons for the Gaiam Balance Ball Chair. The Isokinetics Fitness Ball Chair comes with 60 mm sized wheels and two frame color with a wide variety of ball colors to choose from. It has a height adjustment feature that allows you to customize your chair to four leg height positions and four backrest positions. The Isokinetics features a heavy duty back that can hold your entire weight for additional comfort and back support to help you sit up straight and improve your posture. This chair is also two inches higher than competitor’s chairs featuring a ground up design that completely integrates the additional height in the frame to allow for complete structural integrity. This chair features a 55 cm exercise ball that includes a special durable non-latex material that keeps the ball from breaking. 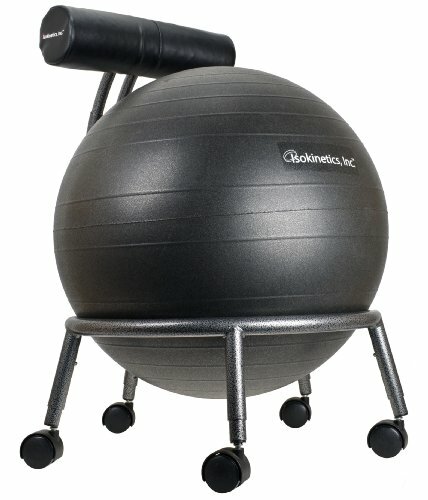 The Isokinetics Fitness Ball Chair also comes with in a variety of colors and a small starter pump. Let’s check out the pros and cons of the Isokinetics Adjustable Fitness Ball Chair. When you need a chair that is specifically designed to help with spine disorders, you need to check out the LuxFit Premium Fitness Exercise Ball Chair. This office chair is specially fitted with a yoga ball that works to provide spine rehabilitation while stopping spine disorders that accompany poor posture. Health experts have designed the LuxFit Premium Fitness Exercise Ball Chair to increase mobility and it utilizes the large wheels for increased stability and comfort. The LuxFit has a lot of great features including a mobility design that allows you to swivel like traditional office chairs, and it is a feature many contemplating a balance ball chair are sorry to give up. The LuxFit allows you to easily glide around the room from your design to file cabinets without your legs having to touch the floor. The large wheels on the LuxFit give the chair a solid feel, so if you are feeling a little uneasy at the sturdiness of the chair, the large wheels should give you some additional confidence. When you are sitting in the LuxFit, you really aren’t aware that you just sitting on a yoga ball since the chair feels so stable. LuxFit also features a solid back support that is a standard feature making it easy to sit back and rest when you get tired. This is also a great feature for any first-time users that need to rest their back a few second occasionally as they get used to sitting straight up. So, what are the pros and cons? If you are looking for an innovative solution to your desk chair needs, the Gaiam Custom Fit Adjustable Chair might be just what you are looking for. When you switch to the Gaiam Custom Fit Chair, you can help to increase your energy levels, strength, and overall health. By turning a regular balance ball into a posture-improving chair, you can increase your core and back strength while you just sit and do you work. When you have proper posture, you increase your back strength enormously by working more of your muscles while you sit. When you have better back strength, you have better upper-body mobility, better circulation, and decreased joint and neck pain. The latex-free balance ball measures 55 cm will not burst, and it’s removable in case you want to engage in some quick stretching exercises or use during yoga. The Gaiam Custom Fit Chair features a cushioned back on a stable and secure metal base, adjustable legs, and lockable, caster wheels. This chair comes with a desktop strengthening and stretching guide, an air pump and a DVD that includes three 20-minute workouts plus three ten-minute “express routines”. 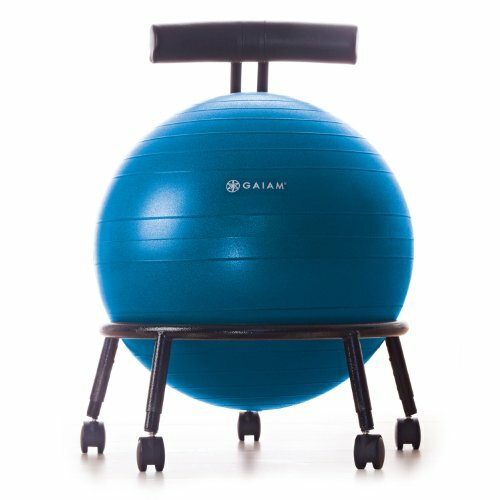 Here are a few pros and cons of the Gaiam Custom Fit Balance Ball Chair. When considering a balance ball office chair, you will be surprised at the number of benefits and features that come along with this innovative chair. Not only can they improve back pain, but they can also help you burn calories while you sit. Balance ball office chairs vary quite a bit, so make sure you choose one that will work with your height and weight to ensure that you will be comfortable while you work.